Facebook Marketing in 10 Minutes a Day: Optimize Your Downtime. Get Facebook on Your Mobile Phone. One of the most common excuses REATLORS® make for not using Facebook as part of their business development plan is that they don’t have the time. To be blunt, this is a weak argument. How are you spending your time prospecting now? Many of you spend three hours or more, every weekend sitting at an open house. Or, you sign up for floor-time at your office waiting for incoming calls to come to the up-desk. Or what about the 10 minutes you are waiting for the showing appointment to appear? Or the 30 minutes you sit and just wait for that signed paperwork to arrive? How much of that is down time? With a smart phone and internet access, all of this down time can be easily spent engaging with others on Facebook. Facebook does have a mobile website (m.facebook.com) that makes it possible to surf Facebook from any mobile optimized web browser. However, the real ease of use comes when you download the Facebook mobile app to your smart phone, which provide a richer, more interactive experience with Facebook from your mobile device. For example, with the iPhone app, it is possible to create a bookmark to your official page making it far simpler to check in on the page and look for any recent activity that you should respond to (or spam you should delete) as we've done for Pixel Coaching in the image to the right. Also important to understand is that 50% of facebook views are from a mobile device. In addition, people that use Facebook on their mobile devices are twice as active on Facebook than non-mobile users. So, if you want to effectively fold Facebook in to your marketing plan, you can become a more engaged user by getting Facebook on your phone. According to a 2010 poll by the California Association of Realtors, 44% of Realtors still don’t have a smart phone. If you are interested in using any form of social media marketing in your business, you MUST get a smart phone. It is the common element amongst every social media savvy Realtor out there. And, if you want to make the right purchase, the phone to get is either the iPhone or a phone with the Android platform. All others, even Blackberry, don’t offer the full level of functionality you need to soar with social media. This is particularly true with Facebook which has been releasing new functionality on its iPhone app before the functionality is available on the other platforms. Make social media easy on yourself - purchase the right phone. So make the most of those three minutes you are waiting for your latte at Starbucks. Get yourself an iPhone or Android and download the Facebook app for your smart phone. You have to have the right tools to successfully execute your Facebook strategy. The phone and Facebook app are the right tools. 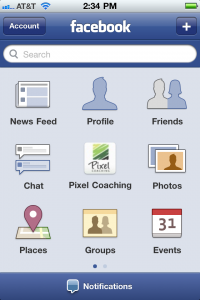 How does the Facebook mobile application help you manage your Facebook presence? What functionality do you think the Facebook app is missing?